A dramatic shift in the first week of Ontario's election campaign may see two of the province's major parties redraw their plans as New Democrats try to build on their momentum and the Liberals seek to hold their ground, experts say. The NDP saw itself in the spotlight during the first stretch of the campaign as the party moved up in the polls, which until then had consistently predicted a strong Progressive Conservative lead with the governing Liberals coming in second. While several weeks remain before the June 7 vote and polls only provide part of the picture, Liberal fatigue appears likely to bolster the NDP, which could prompt both parties to change strategies as they vie for seats in the legislature, experts said. The Tories, however, should continue what has so far been a cautious campaign in order to stay ahead, they said. "It's interesting because the outcome is no longer absolutely certain," even though the Tories still appear poised to win a majority, said Barry Kay, a political science professor at Wilfred Laurier University who specializes in polling and public opinion. The next few weeks could see the Liberals scale back their campaign to focus on ridings they believe they can keep rather than venturing into those held by their rivals, Kay said. The NDP, meanwhile, could travel to regions where they hope to make gains, particularly ridings where they came in close to the Tories in the last election, he said. "The Liberals should be worried about holding seats they've got...for the NDP it will be the reverse," he said. It's unlikely Liberal Premier Kathleen Wynne can turn the tides and score a victory for her party, even if she shifts gears completely, Kay said. "I don't think it matters what she does anymore." Wynne has spent much of the first week touting her record while suggesting that key services such as education and health care could be compromised if her competitors form government. 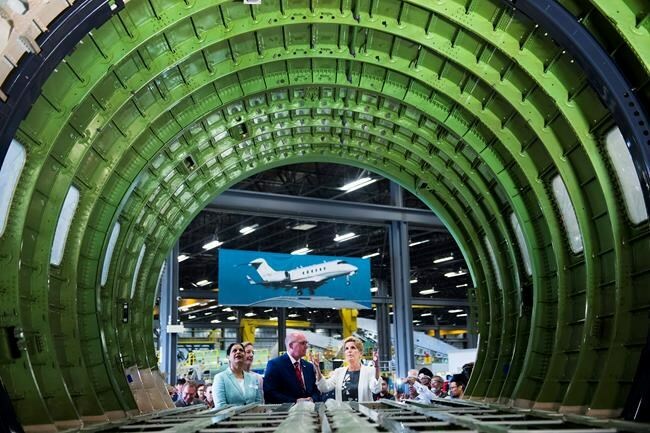 Tory Leader Doug Ford, meanwhile, has continued to promise pocketbook relief through government belt-tightening, which he says he can achieve without job losses. Both leaders have sharpened their attacks on NDP Leader Andrea Horwath, painting her as fiscally irresponsible, while Horwath has pitched herself as a more positive alternative to the other two leaders. In an interview with The Canadian Press, Horwath said she was trying to stay hopeful even as the campaign takes a negative turn. "People generally in the province are more interested in what's next for Ontario. I think it's pretty clear that's what people have been saying for some time now that people want to see a change," she said. "Notwithstanding all the negativity, we're going to try to stay hopeful and show people it doesn't have to be this way." While acknowledging the polls, Horwath downplayed their significance when asked whether she foresaw major gains for her party. "I would never be so arrogant to think that's where or how we look at elections. It's a serious decision people have to make," she said. Wynne, who spent the previous months stressing the "stark contrast" between her plan and Ford's, said in an interview this week that the campaign was a "three-party discussion" and that it was always her plan to focus on the NDP as well the Tories. "I'm certainly sensing it from people that there are lots and lots of Liberals, Tories, NDPers who wouldn't consider voting for Doug Ford and so that makes the comparison of the NDP platform and the Liberal platform even more important because people really need to know what the impact of both of our plans would be," she said. At a campaign stop in Ottawa on Thursday, Wynne was pressed on whether she felt her policy-focused approach could resonate with voters who polls suggest are hungry for change. "I have a strong and deep belief in the people of this province and they will make their decision but we're going to do everything in our power to make sure that they have the information, that they are able to make an informed decision," she said. Ford, who has yet to present a costed platform, bristled Thursday when asked whether he would address criticism over the lack of details in his plan over the coming weeks. "I think I've been pretty in-depth," he said. "Every single day we (make) a new announcement. So, maybe the other two candidates are getting desperate right now. We're making announcements every single day about saving taxpayers money. ... This is a sign of desperation from the NDP and Liberals." With the major policy announcements out of the way, all three parties will be looking for other ways to get a leg up on the competition as the campaign unfurls, said Paul Thomas, a postdoctoral fellow in political science at Carleton University in Ottawa. "Things may move away from policy to ad hominem attacks," and the NDP may see its candidates facing more scrutiny, he said. Overall, the New Democrats have done well to stay largely above the fray while their two opponents battle each other, Thomas said. And while some fiscal conservatives may have qualms about Ford's lack of a costed platform, they are still unlikely to vote for any other party, so it's to his advantage to keep his promises vague, Thomas said. "I don't believe the costings would work in his favour...Just promising and saying he can do it is his best bet," he said. "The main advantage for the Conservatives is they don't have anything to criticize."